Maintaining good bacteria in the body is critical to achieving a healthy gut and a healthy immune system. Fermented beverages are brimming with hard-working, beneficial bacteria that work to improve your digestion, fortify your immune system, assist detoxification, and contribute to a radiant complexion and balanced mind. Healthy bacteria is sensitive to everyday habits such as sugar, caffeine, processed foods, and toxins, and fermented beverages provide some insurance against this. 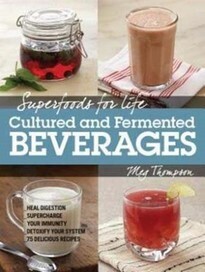 It's time to get back into balance with Superfoods for Life: Cultured and Fermented Beverages. Harness the powerful benefits of this amazing traditional superfood. Drink fermented and cultured beverages for a natural antiviral and antifungal tonic that is a great preventative for colds and flu. Sip kefir to improve lactose intolerance and protect and nourish intestinal cells. Make fermented and cultured beverages part of your beauty regimen for healthy, glowing skin and their natural detoxification benefits. Enjoy 75 recipes for cultured drinks such as kombucha, kefir, herbal and medicinal ferments, and cultured smoothies you can brew at home, including Cayenne Lemon Kombucha, Blueberry Basil Kefir, Beet Kvass, Kiwi Soda, Ginger & Turmeric Fermented Tea, Morning Liver Tonic, Berry Rooibos Kombucha, and Sweet Potato Soda.